Your online store is automatically set up for Free Shipping. But you can add a different shipping method: free shipping, flat rate, and weight based, or a carrier-calculated method. You'll need to be on the Online Store plan to do this. Note: When your customers check out in your store they'll see the shipping method(s) you've selected as well as the shipping charges, if applicable, in their order summary. Click the Store tab, then click Shipping. Note: If you click the wrong image you can go back by clicking Not what you see? Otherwise, follow the steps that appear for the image you've selected. Click Add next to one of the Basic Shipping Methods. You can set an minimum amount for an order to qualify for free shipping. Be sure to note the average shipping time in the description. You can charge your customers a pre-determined rate so they know exactly what their total shipping cost will be. Be sure to note the average shipping time in the description. 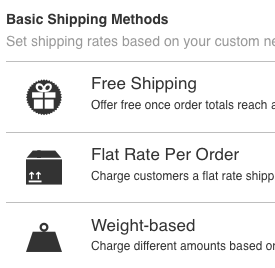 Charge your customers shipping based on the weight of the item(s) you're shipping. Be sure to note the average shipping time in the description. Your changes are automatically saved, so when you're ready click Publish your site to make your changes live. 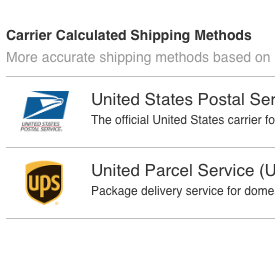 Click Add next to one of the Carrier Calculated Shipping Methods. Both can be used to ship domestic and international. Deciding which method to use is often a matter of personal preference; or convenience, like having an existing account or having a shipping location nearby. Note: USPS and UPS are available to United States merchants only. Choose what USPS shipping methods you want to offer to your customers. If you need more info click the Learn more links. 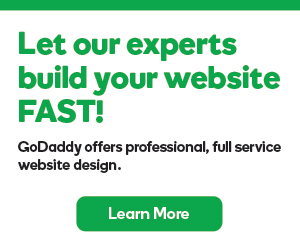 These will take you USPS's landing page where the methods are described. You must have a UPS Access Key to use this method. You can sign up for a UPS account to get your access key. Once you've added your access key you'll want to fill out the Support & Services field, and decide how you want to box your products in the Shipping Boxes field. How do I change the Weights and Dimensions in the Shipping Options to metric?